One day, probably in the far future, I hope that we will be financially secure enough that I can buy myself a cute little sports car. I obviously don't need one and it's definitely not practical with a bunch of little kids, but I have always wanted a nice car, like a Corvette, to just have fun driving around. 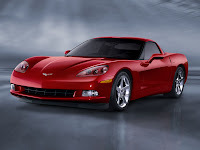 For now I guess I will have to satisfy myself with looking at Corvette pictures and drooling. And I can check out a bunch of cool Corvette accessories for my future fun car. Like those dashboard gages that glow different colors like blue, for some reason I just love those things lol. I would probably get some cool seat covers too, because I know that with kids things tend to get messy no matter what I do and I wouldn't want to ruin the nice leather interior I want. Do they even do leather seats in Corvettes? I don't know, but that's what I want. I'm not sure what color I would want it, though I'm leaning towards red. I'll have to look at some more Corvette pics to see what I like. Someday I want an old muscle car! Like the one from the original Fast and Furious, the black one. Oh yeah! Lol, right now I want a Mazda 3. A black one!